Dissatisfaction with breast size and appearance can lead to a lack of self-confidence and feelings of disappointment with your body. Breast augmentation, sometimes combined with a breast lift, increases the size of your breasts and creates symmetrical, balanced breasts. If you’re interested in discussing breast augmentation with our board-certified plastic surgeon Dr. George P. Chatson, please contact us today. You can schedule a consultation by calling us at 603-882-2103 if you’re in the Nashua area or 978-687-1151 if you’re in the North Andover area of Massachusetts. Contact Our Plastic Surgeon Today! Many women are dissatisfied with their natural breast size. Other women wish to restore breast volume following pregnancy, aging or weight loss. Whatever your reason for seeking breast augmentation, Dr. Chatson can help you determine if the procedure is right for you. Our entire cosmetic team is dedicated to finding a plastic surgery procedure to meet your expectations and goals. Most women’s breasts are slightly asymmetrical. Indeed, divided down the middle, most body parts lack perfect symmetry with the opposite side. However, pronounced asymmetry can be distracting and lead to issues as diverse as emotional dissatisfaction, physical discomfort, and difficulties finding well-fitting clothing options. When this is the case, talking to board-certified Massachusetts and New Hampshire plastic surgeon Dr. George Chatson about your breast surgery options is the first step in achieving a balanced and comfortable appearance. Because breast implants come in different shapes and can be filled to varying sizes, they lend themselves perfectly to adjusting volume individually in each breast. This makes breast augmentation one of the most effective options when dealing with pronounced asymmetry of breast tissue. One of the decisions you will need to make before breast augmentation will be what type of breast implant you are interested in. Breast implants come in many shapes, sizes, and varieties, each offering specific benefits and suited to meet certain goals. Breast implants can be made from saline or silicone gel filler materials. All of these breast implants have silicone exteriors, but their filling is different in thickness, texture, and outward appearance. Some of these considerations will be dependent on your breast implant placement. For example, textured implants are often best for over the muscle placement as they may help reduce the risk of complications such as capsular contracture. Ultimately, it is your aesthetic desires that determine what type of breast implant is best for your procedure. Explaining your desired final outcome to Dr. Chatson is the best way to choose a type of breast implant. With over 20 years of experience helping women in our area achieve the most stunning results, he will ensure that you are provided with the best implant type for your procedure. All implants come with a silicone shell, but saline implants are filled with a sterile saltwater solution after placement. Filling these implants after placement has some distinct advantages including a smaller breast augmentation incision and more control over volume post-placement. Some studies indicate that the overall rate of capsular contracture is lower with saline implants, but this has as much if not more to do with breast implant placement. Saline implants are the only implants that are FDA-approved for women under the age of 22, to as young as 18. The primary drawback to saline implants is that they tend to look and feel less natural than their silicone alternatives. Saline implants are heavier than silicone, and have a higher rate of lower displacement. They are also more likely to result in cosmetic defects such as rippling, wrinkling, and double bubble. Silicone breast implants look and feel most like your natural breast tissue. They are also less likely to develop cosmetic imperfections such as rippling and wrinkling, making them ideal for placement over the chest muscles in women with enough breast tissue to cover the implant. Silicone implants are much lighter than saline, reducing your risk of downward displacement and providing a longer-lasting aesthetic result. One drawback to silicone breast implants is the size of the incision. The incision for the placement of a silicone implant is slightly longer than the incision for a saline implant because the incision must be large enough to allow placement of the pre-filled implant. In all instances, Dr. Chatson places the incision in the least conspicuous area, helping even these longer incisions be more discreet following recovery. 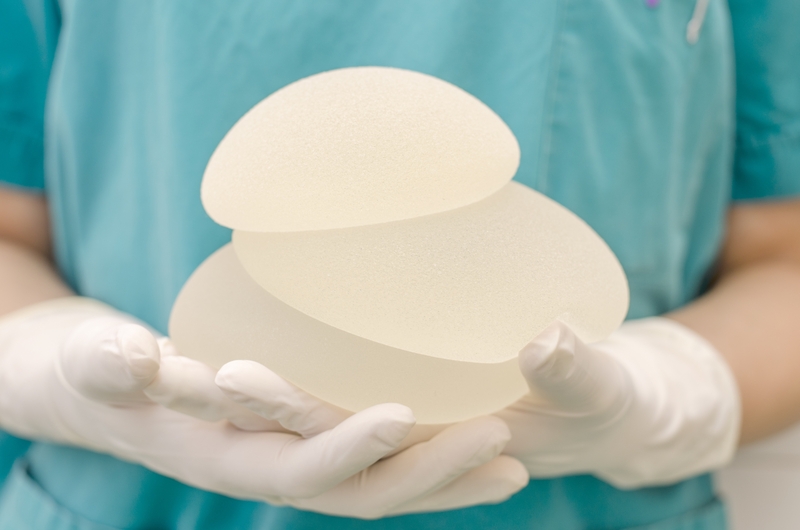 Due to FDA restrictions, silicone implants are only available to women age 22 and older. Both silicone and saline breast implants can provide you with a fuller, more attractive body shape and appearance. During your initial consultation with Dr. Chatson, the type of breast implant most suited to your expectations and breast goals can be determined. Many women who choose breast augmentation desire increased breast size with results that look and feel natural. Sientra cohesive gel breast implants — sometimes referred to as “gummy bear” implants — provide you with another option for achieving your ideal breast size, shape, profile and symmetry. Sientra breast implants were approved by the Food and Drug Administration (FDA) in March 2012 for use in breast augmentation and breast reconstruction procedures. Sientra is only the third company to receive FDA approval for breast implants, and Sientra is the first to receive approval for the durable, form-stable, cohesive-gel breast implants that are also known as “gummy bear” implants due to their consistency. To help ensure that patients are satisfied with the results of their breast augmentation, Sientra only authorizes plastic surgeons board-certified by the American Board of Plastic Surgery (ABPS) to place Sientra breast implants. The cohesive silicone gel used in Sientra breast implants allows your breast implants to maintain their natural contours while providing durability. Sientra breast implants are available in a wide range of sizes and shapes including oval, classic and round so you can find the perfect fit for your individual body type and cosmetic desires; Sientra is currently the only breast implant maker to offer silicone gel implants with a round base. The location of your breast implants will directly affect the final appearance and feel of your breast augmentation and will need to be based on your aesthetic desires and anatomical features. Sub-glandular breast implants are placed just below your breast tissue but above the muscles in your chest. This is often best for women who lift weights or partake in other physically strenuous activity as it lessens risks of breast shape changes during muscle contractions. All types of breast implants can be placed in the sub-glandular location, but you must have sufficient natural breast tissue to cover the implant for this to be an option. Recovery time is reduced with this technique, but certain risks such as capsular contracture may be more likely with over-the-muscle placement. In addition, sub-glandular placement is more likely to result in aesthetic imperfections such as visible implants, bottoming out, and implant shifting which can impact things such as symmetry and cleavage. Sub-muscular breast implant placement is often the first choice of Dr. Chatson. This option places your breast implants below both the tissue of the breasts and the pectoral muscle in the chest. Due to the additional implant protection by chest muscle, sub-muscular implants tend to look and feel more natural. As an added benefit, complications such as capsular contracture are reduced with this option and aesthetic imperfections such as rippling are less likely. Sub-muscular placement requires slightly longer recovery after breast augmentation. Many women find these considerations are offset by the benefits of under-the-muscle placement such as aesthetic appearance, and reduced postsurgical complications. However, no single placement option is ideal for everybody. During your initial consultation with Dr. Chatson, your frame will be assessed, your desires considered, and the placement option best for your body determined. Although a breast augmentation will not adversely impact your pregnancy, you may wish to postpone a breast augmentation if you plan on having children because pregnancy and nursing cause natural changes to your body that can affect the appearance of breasts with breast implants. Most of the concerns regarding pregnancy and breast augmentation focus on silicone breast implants and the ability of mothers with breast implants to breastfeed. Numerous studies in recent years have shown no link between silicone breast implants and increased health risks to mothers or infants. Furthermore, research has demonstrated that the breast milk of mothers with silicone breast implants does not contain elevated levels of silicone. For most women, breast implants will also not affect the ability to breastfeed. However, if a peri-areolar incision is used in breast augmentation surgery, there is a minimal chance of disrupting the milk ducts; so if you plan on becoming pregnant after breast augmentation, Dr. Chatson may recommend a different incision option. It’s important to note that some women, regardless of whether they have undergone breast augmentation, are unable to breastfeed. Breast augmentation, like any surgical procedure, will require some preparation. 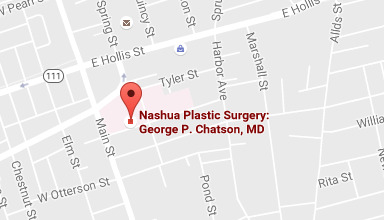 Board-certified Salem plastic surgeon Dr. George Chatson will provide you with specific instructions during the scheduling portion of your treatment, but having a general idea of what will be required can be very helpful when initially planning for your procedure. If you have questions about breast augmentation or any of the recommendations on this page, please be sure to address them during your initial consultation at our Andover, MA or Nashua, NH office. Immediately following your procedure, you will be fitted with a surgical dressing and a surgical bra. For the first 48 hours, you will need to allow yourself plenty of time to rest. It is necessary that you refrain from showering during this time and also arrange for help with household duties. After 48 hours, you may remove the bra and surgical dressing in order to shower, and then make sure to replace the bra for support. Drainage tubes are usually not required for primary breast augmentation patients, but may be utilized in patients undergoing exchange of their breast implants. If placed, drainage tubes are usually removed within 2-5 days postoperatively. Pain and swelling will accompany your recovery. Dr. Chatson will provide you with medications, such as a muscle relaxant and a pain medicine, to lessen the discomfort. Swelling can be reduced with rest and by wearing the support bra. Walking several times a day during the first few weeks of your recovery is very helpful. Swelling reduces gradually over a period of 4-6 weeks after surgery. Depending on breast implant placement and other factors, you should be able to return to work within one week, but more strenuous activities should wait for at least four weeks. This will vary from person to person. Be sure to consult Dr. Chatson prior to resuming your normal work and exercise routines. Your breast augmentation should be designed to achieve the look you want. Dr. Chatson listens to your goals and cosmetic wishes, and then he explains the best ways to fulfill your expectations. Enhancing your breast size can increase your feelings of confidence and femininity. If you are unhappy with the appearance of your breasts, breast augmentation might be the right choice for you to increase volume while improving shape and symmetry. 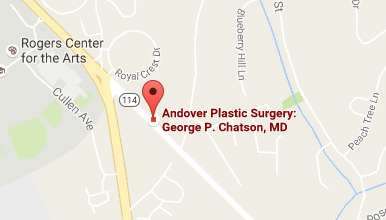 If you want to find out if breast augmentation is right for you and you live in Andover or Lowell, Massachusetts; Nashua, Salem, or Manchester, New Hampshire; or the surrounding areas, please contact George P. Chatson, MD, online or call our Massachusetts office at 978-687-1151or our New Hampshire office at 603-882-2103 to schedule a consultation.